My friends, tomorrow is the last day of Chanukah, the Jewish festival that commemorates the victory of the Jewish freedom fighters, the Maccabees, over their foreign oppressors. Is this relevant to our lives today? Certainly it is relevant to the Jewish people, but what if you are not Jewish or have little connection to the nation of Israel? It still has a powerful message. The Maccabees faced a situation that looked hopeless; a small band of believers up against the most powerful army in the world. They were also up against another enemy; the apathy of the vast majority of their own brethren. Imagine, leaving your home, gathering with a band of zealots, living in caves, wandering from place to place, never knowing what perils the new day will bring. You have nothing but your faith and your convictions to keep you going. All seems lost. Mattathias the Elder began the revolt. "Who among you who is faithful to the laws of God join with me!" At first it was his family, soon other followers joined. Before long it was a force to contend with, a force that defeated the great enemy forces. Even with a big guy pointing a gun at your head, there is still hope. Brittany, Virginia, USA. Sometimes in our own lives we feel this way. You may live in a poor urban area. The forces you have to contend with are street gangs and drug dealers or maybe even just school bullies. Or is it large multi national companies? Is it debts and credit card bills that you must deal with? Sometimes we just feel overwhelmed. It is at times like these that we must look to the Maccabees for some inspiration. Surely your situation is not worse than theirs. We have to remember that the human being has great sources, great inner strength that we can reach for when we need it. We have what it takes to overcome the odds. We have what it takes to turn the tables in our favor. We are the Maccabee – the Hebrew Hammer! Modern day Krav Maga is a continuation of this sprit; the belief that the small nation of Israel can stand up to the world, that the David can once again overcome the Goliath. 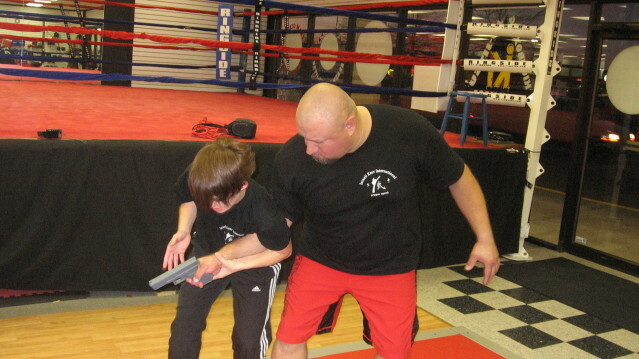 Krav Maga believes in empowering the individual, not only with self defense skills but more importantly with a Maccabee mindset. No enemy is too strong, no problem is too big, no Goliath can bring you down. So rise up my friends, rise up at this time of year, raise the banner of revolt in your own life and be victorious!